Time off is for vacation. Not recovering from a peel. The Refinity System is a combination of an in-office peel procedure and a Daily Home Skin Care Regimen. Great for exfoliation, pigmentation, acne, and overall rejuvenation! Minimal downtime. Maximum potency. Complete Confidence. High (AHA) concentration, low-pH peels are known for their ability to deliver effective skin renewal and exfoliation. However, they have one major downfall: unwanted downtime because of the resulting irritation and redness. Finally, there’s a glycolic peel and at-home daily skin care regimen that won’t disrupt your schedule with inconvenient side effects. The Refinity 50% and 70% glycolic acid peels and daily home skin care regimen with the exclusive patented COSMEDERM-7 anti-irritant technology offer the most effective skin exfoliation and renewal with virtually zero downtime for all skin types, so you can get the best of both worlds-the complete benefits of a high potency peel treatment and the complete freedom to be up and on the go. With the Refinity Skin Health System, you can maximize your uptime and forget about the downtime. Get the results you want without the hassle. • The exclusive, patented COSMEDERM®-7 anti-irritant technology delivers extraordinary comfort for all skin types • With Refinity, you can enjoy UPTIME™—the freedom to keep going with your busy life immediately after a peel and the days after • Refinity peels: the highest commercially available glycolic acid concentrations (50% and 70%) with low pH levels (pH 1.2 and pH 0.6) • Refinity daily home skin care regimen: 15% lactic acid (pH 3.2) formulation that extends the peel’s benefits (refrain from use until 48 hours after peel treatment) Visible results after 6 peel treatments during a 12-week period. Dr. Tess presented Refinity Peel to the celebrities at the Official 42nd Annual Daytime Emmy Awards Beauty Bar/Gift Lounge on April 25! “before” taken immediately before patient began treatment with Refinity. “after” taken immediately after patient completed 12 weeks of treatment with Refinity. Photographs have not been retouched. Time off is for vacation. Not recovering from a peel. 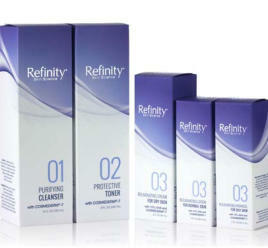 The Refinity System is a combination of an in-office peel procedure and a Daily Home Skin Care Regimen. Great for exfoliation, pigmentation, acne, and overall rejuvenation! Minimal downtime. Maximum potency. Complete Confidence. High (AHA) concentration, low-pH peels are known for their ability to deliver effective skin renewal and exfoliation. 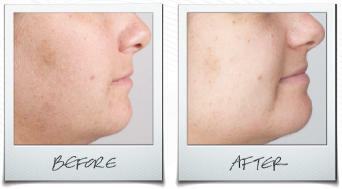 However, they have one major downfall: unwanted downtime because of the resulting irritation and redness. Finally, there’s a glycolic peel and at- home daily skin care regimen that won’t disrupt your schedule with inconvenient side effects. The Refinity 50% and 70% glycolic acid peels and daily home skin care regimen with the exclusive patented COSMEDERM-7 anti-irritant technology offer the most effective skin exfoliation and renewal with virtually zero downtime for all skin types, so you can get the best of both worlds-the complete benefits of a high potency peel treatment and the complete freedom to be up and on the go. 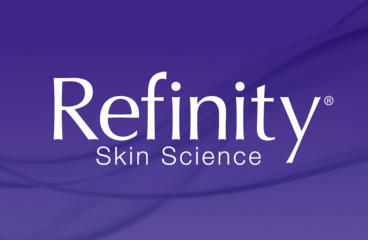 With the Refinity Skin Health System, you can maximize your uptime and forget about the downtime. Get the results you want without the hassle. • The exclusive, patented COSMEDERM®-7 anti-irritant technology delivers extraordinary comfort for all skin types • With Refinity, you can enjoy UPTIME™—the freedom to keep going with your busy life immediately after a peel and the days after • Refinity peels: the highest commercially available glycolic acid concentrations (50% and 70%) with low pH levels (pH 1.2 and pH 0.6) • Refinity daily home skin care regimen: 15% lactic acid (pH 3.2) formulation that extends the peel’s benefits (refrain from use until 48 hours after peel treatment) Visible results after 6 peel treatments during a 12-week period. 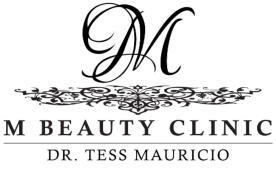 Dr. Tess presented Refinity Peel to the celebrities at the Official 42nd Annual Daytime Emmy Awards Beauty Bar/Gift Lounge on April 25!